It is believed that we spend roughly one third of our lives sleeping. Some estimate that we spend 217,175 hours in bed. Whether you’re a high flying executive or a snooze happy student, having a comfy bed is one of the finest pleasures in life, and a good nights sleep is essential to be firing on all cylinders the next day. At House Of Oak, we stock a wide range of beautiful solid oak beds, with the bedroom furniture to match. Here are a couple of our favorites. This Wentworth 6ft King Size Sleigh bed from Halo is the ultimate in opulence and luxury. Big enough to really stretch out in. Even if you have to share, you are practically guaranteed a good nights sleep. Made from solid oak and of course with the expert craftsmanship that you expect from Halo Furniture, this oak bed is perfect for a night of pleasant dreaming. 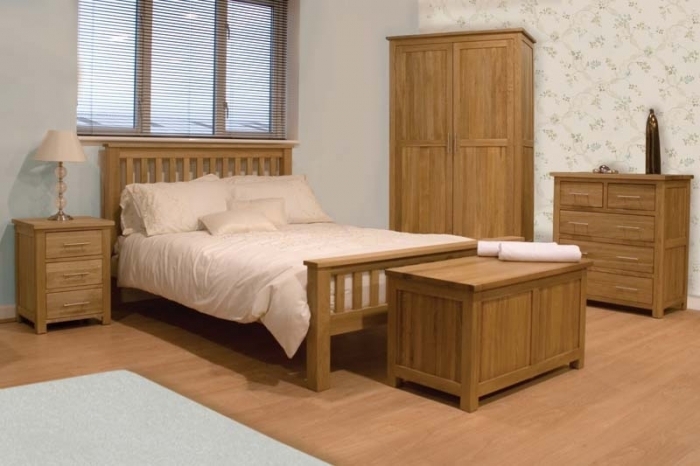 If a 6ft bed just seems a little too much, then the Opus Solid Oak collection of bedroom furniture may be more suitable. As the name suggests, this range is 100% solid oak through out, designed in a contemporary yet understated style, and ideal for creating a calm and tranquil environment. The ideal way to unwind after a hard day.